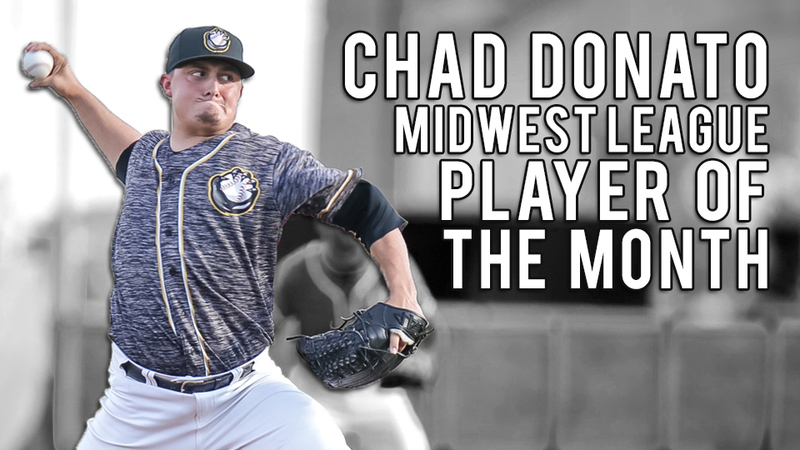 Quad Cities River Bandits pitcher Chad Donato has been named the Midwest League Player of the Month for August. He is the first River Bandits player to win a monthly award this season. A Bandits pitcher was selected as the Midwest League Pitcher of the Week five times this season. Donato was victorious in all six of his starts in the month of August, posting a 6-0 record and 1.23 earned run average. In 36.2 innings of work, the right-hander struck out 46 and walked only seven. He surrendered 19 hits and six runs, five of which were earned. Opposing hitters struggled to a .154 batting average against Donato in August. On the season, the native of Cypress, Texas is 6-0 with a 2.04 earned run average. He was honored as the league's pitcher of the week for his performance during the week of August 13-19. The 23-year old was drafted by the Astros out of West Virginia University in the 11th round of the 2016 draft. He started the season in Tri-City and was the ValleyCats starter on opening day. The River Bandits will play one more game to close out the regular season on Monday afternoon at 1:15 p.m. against the Peoria Chiefs. They open a first-round playoff series in Peoria on Wednesday, September 5 at Dozer Park and return home for games two and three (if necessary) on September 6 and 7. First pitch for both home games is slated for 6:35 p.m.